Chewy, chunky, sweet and creamy. All the naughty things in this one. Suffering from a strong urge to make honeycomb last week left me with a huge amount to eat. My inner sweet tooth went (slightly) crazy and the result is these mini honeycomb ice-cream sandwiches. I have used parfait rather than an ice cream for two reasons. Firstly, you don’t need an ice cream churner as the aeration is done during the whipping of the ingredients; and secondly it is just SUPER easy to make! Add any/all the toppings that your hearts desires, there is absolutely no rules with this one. 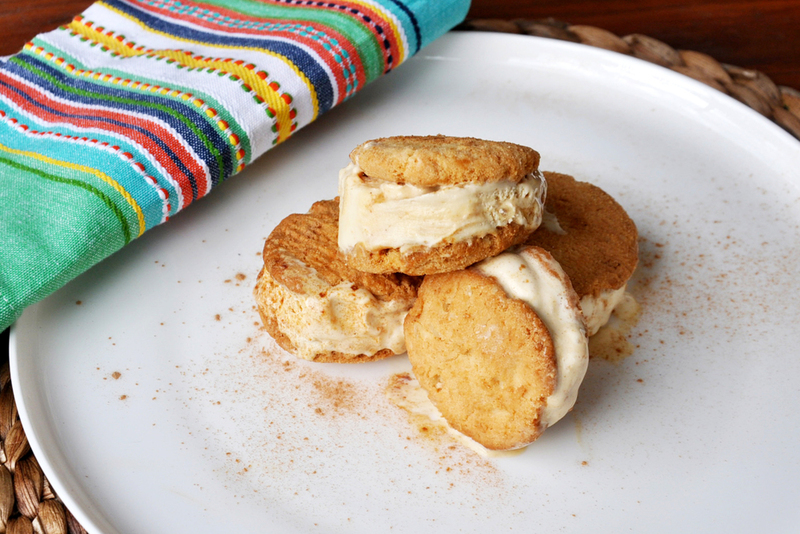 By all means use store bought ice cream if you are short of time, and you can even use store bought biscuits too. I do highly recommend making your own short bread though… it’s much more buttery and delicious! WARNING children should be kept away from the stove while making honeycomb as the sugar reaches high temperatures it will burn if it touches the skin. Place honey, glucose and sugar in a saucepan over high heat. Cook until mixture reaches 166C. If you don’t have a sugar thermometer you can test the mixture by putting a drop in iced water. If it is hard and snaps when cold the mixture is ready. If it is soft or grainy then it will need a bit longer. Remove sugars from heat and let sit for a moment to allow to settle. The mixture will bubble up super fast once you add the bi-carb soda so have a tray lined with lightly greased baking paper prepared. Add bi-carb soda and whisk quickly to combine. Immediately pour out into the prepared tray. Once cooled, break into pieces. Set aside. Whip the cream to soft peaks. Over a pan of simmering water, whisk yolks and sugar in a mixing bowl until double in size, and thick and pale. Gently fold the mixture together. Once combind add a handful of honeycomb pieces. Place into a freezer proof container and freeze for at least 4 hours. Cream sugar and butter. Once combine add flour and mix into a paste. Roll out dough to 1cm thick and place on a baking tray. Allow to rest and cool in freezer for 15-20 minutes before placing in oven. Bake until golden, about 10-12 minutes on 180C. Using a 10cm cookie cutter cut out the biscuits while still warm. I like to cut the biscuits after cooking, that way they are the all the same size as they spread during cooking. You can either cut out rounds of parfait using a cookie cutter, or do as I do and just scoop out the parfait on to the short bread, sandwich with another biscuit then smooth the edges with a butter knife. Once assembled place the sandwiches back into the freezer again for 10-15 just to firm up a touch. You’ve waited long enough, go ahead and devour them! (I did quite literally the second after the photo was taken)! Change things up and add what you like to the parfait! I had some left over agave syrup so I mixed that through with mine as well as some crumbs left over from the short bread. Yummmm.